Oops! 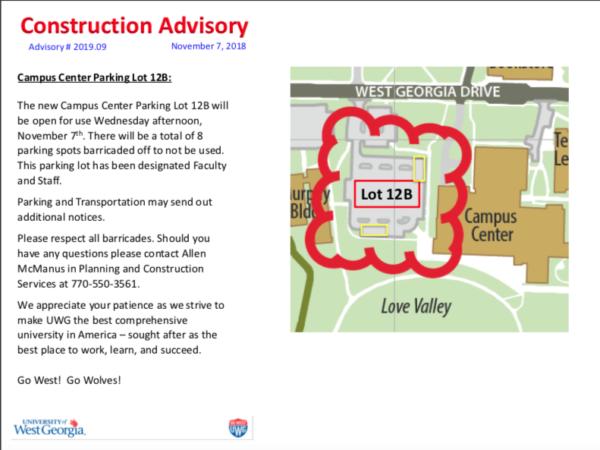 Mistake on Map Adds to UWG’s Parking Woes Reviewed by Webmaster on February 6, 2019 . University of West Georgia students are expressing frustration after a long-anticipated parking lot opened exclusively to faculty and staff. Following the conclusion of the Spring 2018 semester at UWG, construction began on an additional parking lot that would provide even greater accessibility to the Campus Center and much of central campus. Parking and Transportation Services distributed maps to all students who received a parking pass at the beginning of the Fall 2018 semester that indicated the new lot would be designated “open parking.” Lots designated “open parking” are open to faculty, staff, and all students with parking passes excluding Residential Freshmen. Summer Jones is one student who received the map and told The WOLF News she feels mislead. “I kinda get here and it’s like ‘oops we made a mistake on the map we handed out to every student that goes here, and you’re not allowed to park there,’” she said. Parking and Transportation did not communicate to students information about the lot’s designation. Only after signs were posted indicating the lot’s restriction to faculty and staff did students realize there had been a miscommunication. Faculty and staff did receive an email on November 7th which is the first known communication about the lot’s designation. The WOLF News took the issue to Associate Vice President of Auxiliary Services Mark Reeves who says the designation on the map was a mistake. “If we made an error on the map or in the communications, I apologize for the confusion – although I do have [to] point out that the lot in question is still being finalized and thus should have caused little parking challenges this semester,” Reeves said over email. “We monitor parking closely so that we can effectively balance parking demand with parking supply. As a matter of fact, we actually count ‘lot usage’ almost daily,” Reeves continued. 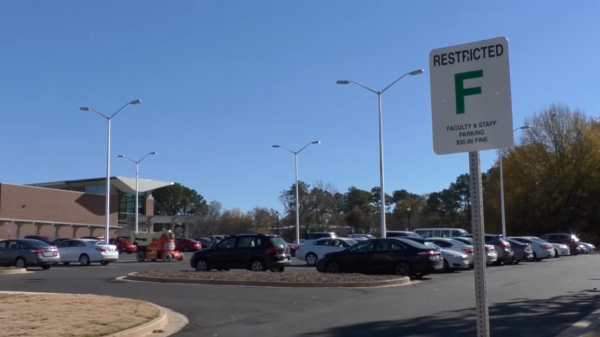 In the weeks since the new faculty and staff lot opened it has experienced light to moderate usage during UWG operating hours but does not regularly reach full capacity. The smaller lot adjacent to the new lot that was designated “open parking” at the beginning of 2018 following the relocation of UWG’s electric substation. During the faculty lot’s construction, the student lot was redesignated exclusively to construction vehicles until the new lot was opened in November, whereupon it was redesignated open parking. However, complaints about parking availability have been consistent for some time. UWG students reported parking as the 2nd highest negative at UWG on the 2017 National Survey for Student Engagement. Speaking to SGA earlier this year, Reeves said UWG’s parking issue is not availability but convenience. “We actually have a lot of parking spaces, when you ask students that they don’t feel that way because most of them are on the other side of campus,” Reeves said.